The Companion Range of Computer Tables from Godrej Interio Home offers you a choice of 10 functional models that suit all your e-needs. 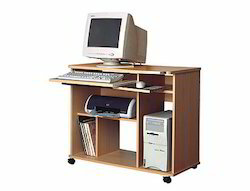 All these models made of particleboard feature keyboard pull out trays and lockable castors. The C9 offers a simple curvilinear profile and is a compact option. Target 105 is a traditional simple computer with the facility to accommodate all and sundry. Product Description: Comfort at work now comes with economic and handy pricing. Strong yet elegant computer tables are now the incessant need of individuals. Mdf tables with PVC lamination and with powder coated metal understructure give it the strength and style. We are engaged in supplying Godrej Computer Table. The Companion Range of Computer Tables from Godrej Interio Home offers you a choice of 10 functional models that suit all your e-needs. All these models made of particleboard feature keyboard pull out trays and lockable castors. We are supplier of Godrej Computer Table. The Companion Range of Computer Tables from Godrej Interio Home offers you a choice of 10 functional models that suit all your e-needs. All Godrej Computer Table models made of particleboard feature keyboard pull out trays and lockable castors. The C11 is an economical and functional model available in attractive Honey & Cherry shades. We are one of the main supplier of Godrej Computer Table. We are prominent supplier of Godrej Computer Table. We are supplier of Godrej Interio Computer Table . We are offering Godrej Interio Computer Table. The Companion Range of Computer Tables from Godrej Interio Home offers you a choice of 10 functional models that suit all your e-needs. 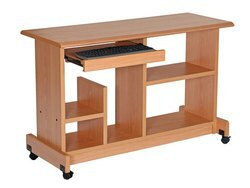 All these models made of particleboard feature keyboard pull out trays and lockable castors. The C2 is ideal for a working environment and comes along with the convenience of a lockable storage unit. We are offering Godrej Target 102 Computer Table.